i revised my initial review. After sleeping on these linen sheets, the airy feel is life changing! They keep me cool, dry and are extremely comfortable. I need more! Beautifully casual and incredibly comfortable, linen adds light, airy softness to your sleep and vintage washed style to your bedroom. This duvet cover set features a button-close duvet cover made of 100-percent linen from the finest French-grown flax. Cover has eight inner ties four at the corners and on the top, bottom, and sides - to secure a duvet without bunching. Set includes two matching linen pillow shams with a 2-inch flange to complete the look of your room. this is a dreamy fabric! such softness is unique. It does have the wrinkle tendency of linen, so you would have to be ok with that. I am returning it only because the color does't work with what I have going on. Otherwise it would be a treat to sleep under. The cover is very average for the cost. 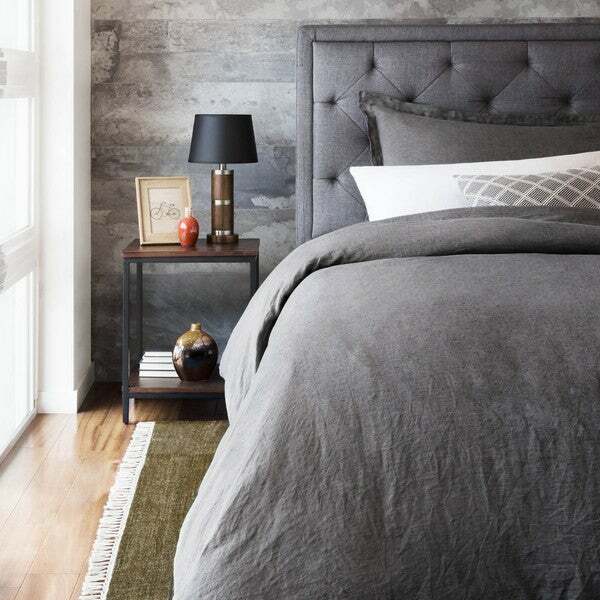 I have paid a lot less for a Duvet and it was much better quality and texture than the Malouf Duvet. Wasn't impressed for the price point. Linen was too thin. "Is this a nice for summer and winter?" Yes, this french linen set is very breathable. It works well for summer and winter months and the duvet insert can be changed out for a lighter comforter in warm months and a heavier comforter in cool months.